Before investing in augmented reality retail, there is one key question all brands must answer. Can augmented reality help them achieve their business goals? Whilst the answer for many brands is a resounding yes, understanding the use cases for augmented reality that will help them transform the way they do business and communicate with their customers can often be seen as a daunting journey for brand owners to undertake. The following examples of augmented reality retail solutions are based on our first-hand experience working with some of the world’s biggest retailers and we have combined this with existing research to examine how consumers prefer to interact with AR as part of their shopping experience. Despite the rapid growth in online shopping, consumers still like to visit bricks and mortar stores and retail brands are looking for new ways to drive footfall to their stores. The challenge for brands is making sure that consumers choose their store and not their competitors, and augmented reality provides an added incentive according to research citing that 61% of respondents said that the technology has changed where they decide to shop. Augmented reality can help brands create memorable customer experiences by bridging the gap between traditional and online shopping, providing customers with new incentives to visit the physical store. As well as creating location-based AR incentives only redeemable in designated stores, we have worked with Tesco to develop augmented promotions such as the Disney Frozen AR sticker book to pull customers into stores. 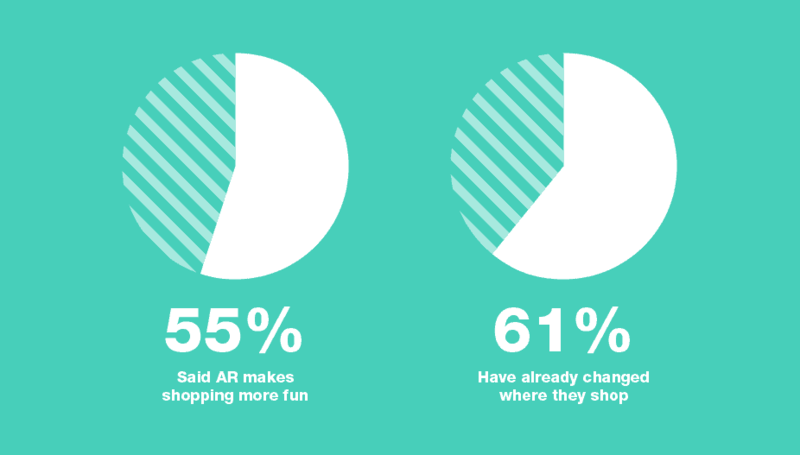 In addition to consumers finding AR technology helpful, research has highlighted that 55% also said that AR makes shopping fun, and 45% reported that it saves them time – using these insights, retailers can develop new incentives to direct customers away from their competitors and increase store visits using augmented reality. 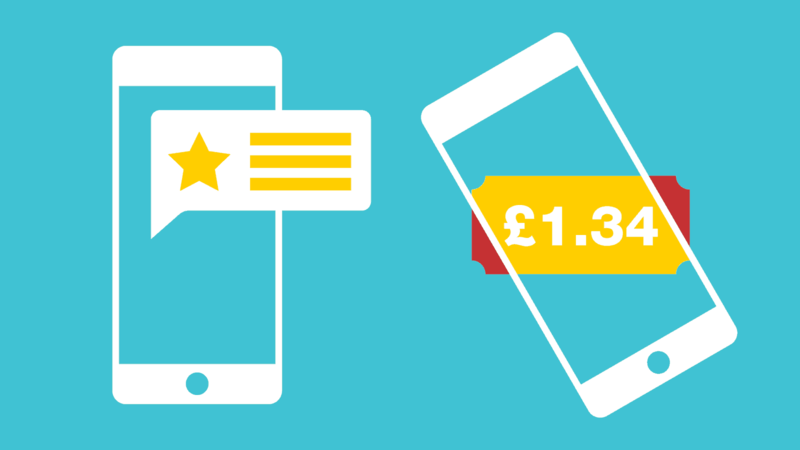 Whilst generating more store visits is important to retailers, making sure that customers are truly engaged when they are in store is key to converting footfall into revenue. Augmented reality retail solutions certainly have a part to play in building this engagement, with our own research on Brand Engagement finding that AR experiences deliver super-charged dwell times, engaging users for 10x longer than traditional channels. 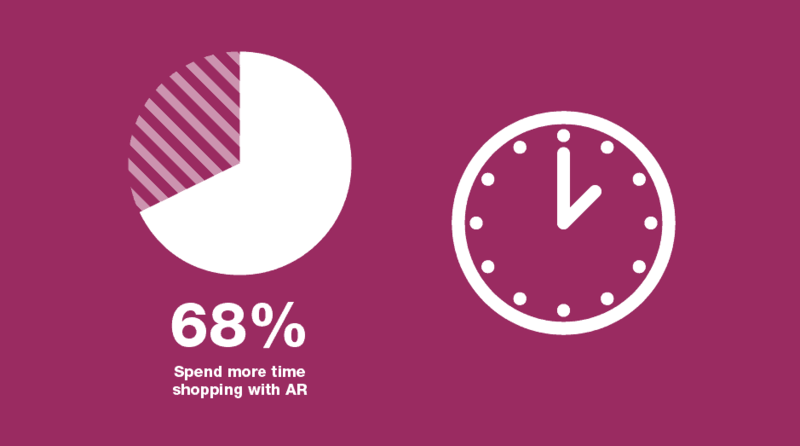 According to research, 68% of shoppers would spend more time at a retailer if they could shop with AR and so introducing the technology in-store is a good way of keeping shoppers shopping (and engaged) for longer. From the providing Lacoste customers with a unique virtual try-on experience in-store for a new product launch, to the in-store augmented Easter egg hunt created for Tesco, we have used AR as a way of enhancing the existing in-store experience. 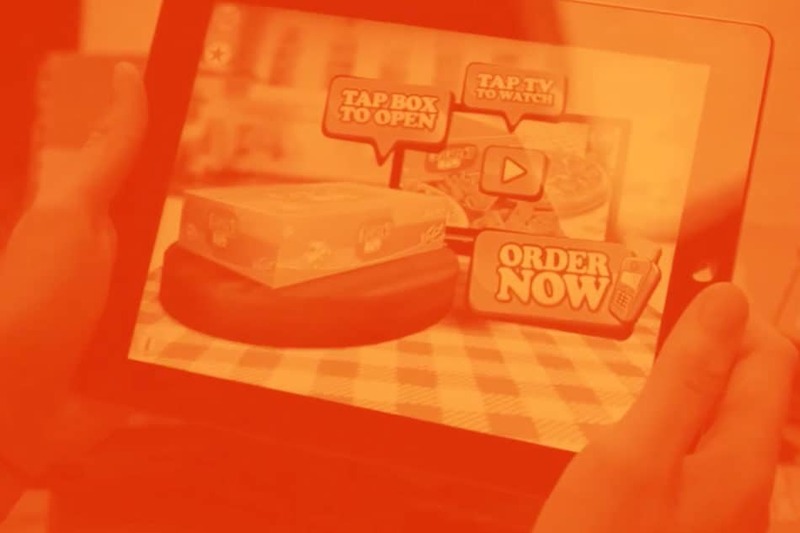 Such augmented reality experiences can be personalised and work in tandem with other digital-first retail innovations such as alternative checkout methods and virtual store assistants, providing shoppers with an engaging and connected in-store experience. With separate research showing that 69% of 18-24 year olds would be more loyal to a brand which offered them access to better technology such as AR, driving in-store engagement through augmented reality has to be seen as integral to the retail environment. We have often described AR product visualisation as ‘the ultimate try before you buy for the digital age’ – the ability to showcase your products in an innovative, immersive and interactive way using augmented reality is something that major retailers such as IKEA and Argos (with our help) are increasingly integrating into their sales process. This investment in AR is backed up by the research with 40% of shoppers researched saying that they would be more willing to pay more for a product if they could experience it through augmented reality. Separate research has also shown that 51% of consumers have put off home improvements because they can’t imagine what the finished product will look like. We have worked with a number of retail brands on AR product visualisation projects, all designed to help overcome specific business challenges. The AR catalogue app we created for premium brassware manufacturer VADO houses over 700 3D products all optimised for use in AR experiences and delivered through a bespoke CMS. 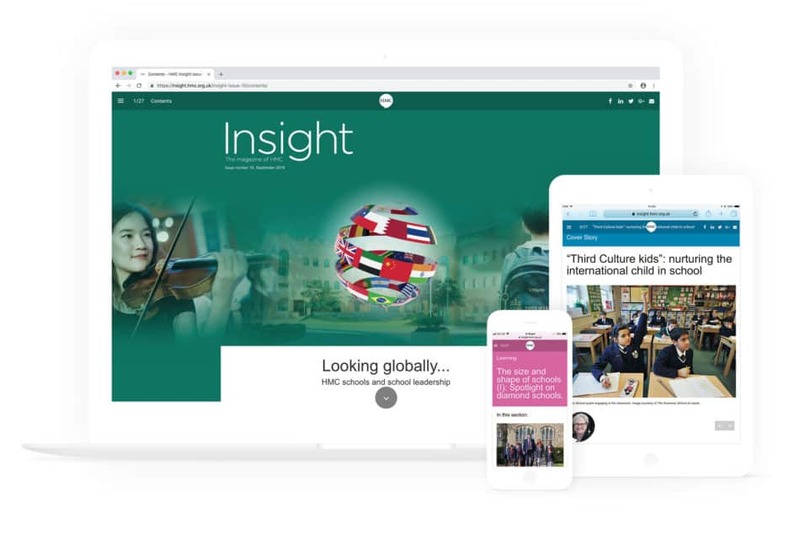 This has provided them with a unique and engaging way to get their products in front of consumers at scale and shift their strategic focus on the B2C market. What does this product look like in my home? How does this product look on me? Augmented reality has the potential to increase sales and impulsive purchases because it helps overcome barriers to purchase in a visual and interactive way for consumers. 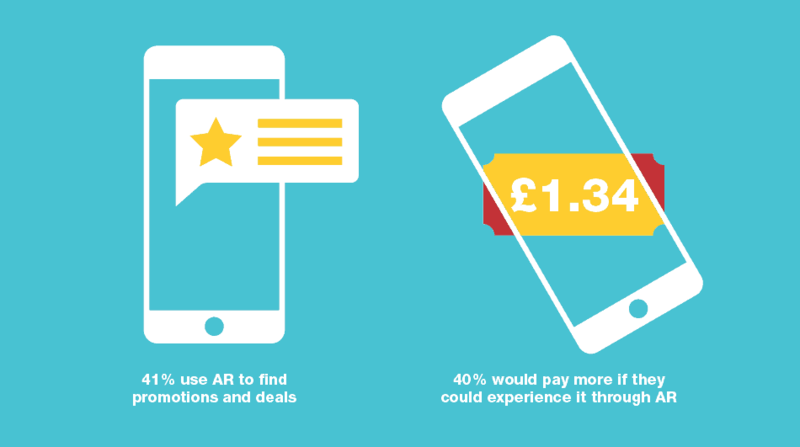 Alongside improving conversion rates, AR product visualisation is being used to save money on potentially costly returns. With research estimating that returns cost UK retailers £60 billion every year, this is a big deal and a big challenge that needs to be addressed by retailers. Will this product fit in my room? Which other products match this product? Which colour product looks best in my room? 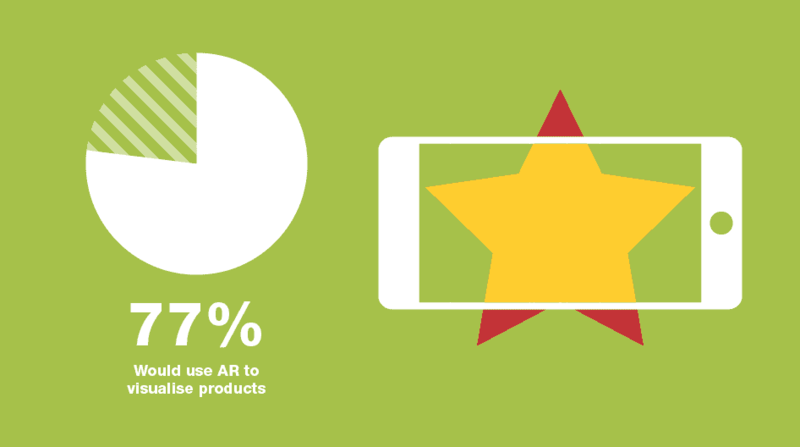 With 77% of shoppers researched wanting to use augmented reality to see product differences such as a change in colour or style, retailers have the opportunity to not only reduce returns, but also up-sell related products. This, combined with advances in using AR as a measurement tool, can provide retailers with new more scalable and cost-effective ways to showcase their products to consumers without the need to have big retail spaces or hold large stock inventory. AR experiences not only improve brand engagement with longer dwell times but, unlike many traditional channels, provide contextual data that can be used to understand customer behaviour, measure the success of activity, and improve future communications with consumers. This level of understanding and data on their customers is hugely valuable to retailers and can feed into another emerging technology that is set transform the retail world – Artificial intelligence (AI). AI has the potential to allow retailers to personalise the shopping and product experience utilising data and is the perfect bedfellow for augmented reality. The AR experiences we develop for our clients have built-in analytics which are bespoke to each client. 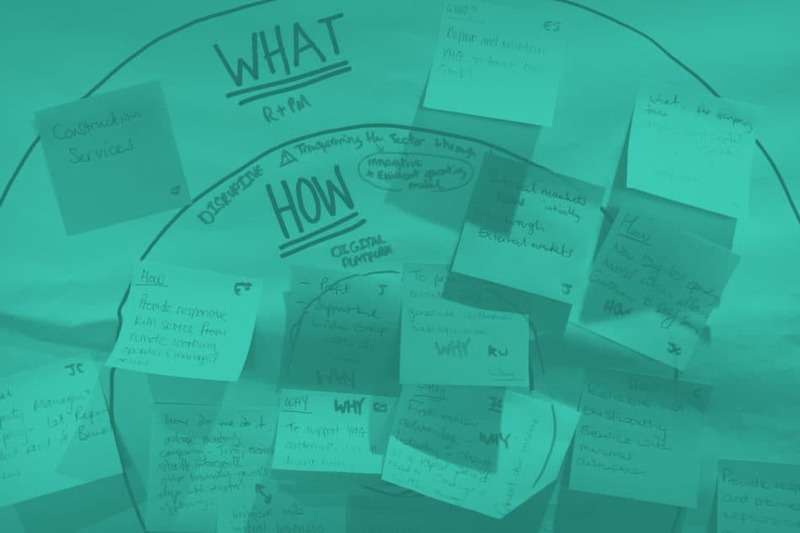 From simply measuring session numbers and dwell times through to understanding where and when users prefer to interact with the AR experiences, we can define project KPIs based on business objectives. Working with BIC we have developed and deployed an augmented reality game experience and companion colouring book product which is monitored and updated to ensure that the product remains best-in-class.  This has resulted in an award-winning digital product – the DrawyBook – which continues to retail successfully nearly 2 years since launch, helping BIC to achieve their objective to stand out as the colouring brand of choice for fuelling child development. Data is key to the success of modern retailers and augmented reality has the potential to provide retailers with rich and dynamic data like no other channel. With all of the major players in the tech world, including Apple, Amazon, and Facebook, investing heavily in the technology, it’s clear that augmented reality is going to be a key part of our digital near-future. Deloitte’s Retail Trends for 2018 places AR front and centre as the technology that is central to the transformation of retail with all 3 key themes – Reimagine the store, Experiment with experience and Transform your business – all having a strong augmented reality link. AR is very much ready for mainstream adoption and should no longer be perceived as simply a gimmick but rather as an invaluable tool for increasing sales, building engagement and improving efficiencies. To start monetising your retail proposition using AR, get in touch with our team of experts to set up an informal discussion to find out how augmented reality could benefit your business.